Dead Sea Bath Salt is for BATH/SPA use only and is NOT a food-grade salt suitable for consumption. This is 25kg of Dead Sea Carnallite Salt. Our product has the highest quality that can be found on the market. Highest quality salt, extremely rich in Minerals derived from the Dead Sea In Jordan where Pollution is almost Null .The product is 100% natural -contains no additives. ​A fast test you can do yourself is to simply taste the salts before buying . If the salts you are about to purchase taste salty like table salt , then the seller has intentionally or unintentionally misled you. Widely Reputed Soothing Effects Of The Dead Sea Can Now Be Enjoyed In The Privacy Of Your Own Home! Bring The Dead Sea Bath Salt From The Dead Sea To Your Bathtub For Relaxation And Relief From Skin Troubles Or Daily Stresses. The benefits extend well beyond the bath, and guarantees the purest Dead Sea Bath Salt on the market, offered in a selection of grain sizes to ensure you have the ideal fit for your project. Dead Sea Bath Salts are rather “cloudy” in color, as opposed to crystal-clear table salt harvested from the southern Dead Sea in Jordan, where the concentration of minerals is the highest. The waters of the Dead Sea are very distinct, having a total salt concentration that is ten times higher than ocean water, reaching 33% versus 3%. The one of a kind composition of this special sea’s brine is uniquely comprised of magnesium, potassium and calcium chloride. Additionally, the Dead Sea has a high concentration of bromides, which all contribute to the renowned healing properties. This extraordinary composition has made the Dead Sea an ideal spot for people seeking relief from skin and rheumatic disorders, and an equally popular choice for vacationers seeking relaxation. In fact, these soothing waters have a reputation that dates back over 2,000 years to a time when Cleopatra established the world’s first known “Day Spa” on its shores. It is agreed by many health professionals that Dead Sea Salt is the most therapeutic of all Bath Salts. 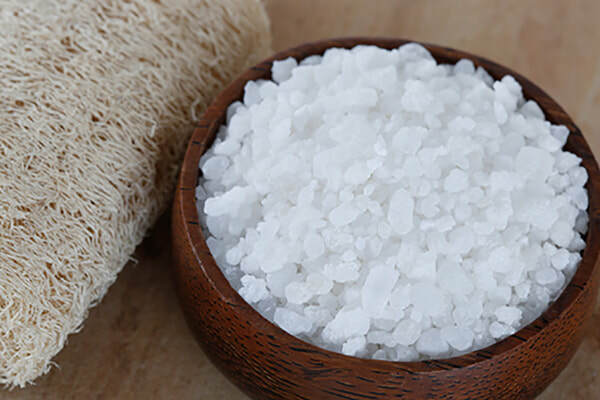 Dead Sea Bath salt is popularly used to help ease the symptoms of mild to severe dry skin issues, such as psoriasis and eczema, as well as to help alleviate arthritis, joint and muscle pain. The salt is also utilized for whole body detoxification benefits. With a sodium content of less than 12%, it is gentle on the skin. Its natural skin softeners and muscle relaxing properties make this salt truly exceptional. Dead Sea Bath Salts is An exceptional Dead Sea Minerals Extract provides your body with tremendous healthy and therapeutic remedial benefits. The body will directly absorb the natural Minerals as soon as the Salt dissolved in the bathtub . It nourish the skin, build resistance against common skin diseases, releases you of exhaustion & fatigue, and makes your body smooth and glowing . Size and texture varies between different bath salts as well; when you use large-grain bath salts, you’ll notice they not only look beautiful in the bath, but take a bit longer to dissolve. You can use smaller-grain bath salts as scrubs for exfoliation. If you would like to use bath salts for exfoliation, simply take a small handful of fine-grain bath salts and add a tiny bit of water. Work the mixture into a paste and smooth it over your skin. You’ll be softer and smoother than you ever imagined! Now that you know how to use bath salts, you can enjoy all the benefits of bathing. Relax, unwind, and enjoy your bath..